If you have a mouth full of crooked or crowded teeth, you may be self-conscious about flashing your smile. It is important to realize that a misaligned bite can also lead to serious oral health problems. These problems may include headaches, pain while chewing, TMJ, and facial pain, just to name a few. Correcting crooked teeth or a misaligned bite will help you avoid these oral health problems, restore your confidence, and improve the aesthetics of your smile. Many patients may be hesitant to correct this problem because they do not want to face many months of wearing clunky metal braces. Dr. Michael Bixby understands this, which is why, at his Red Bank cosmetic dentistry practice, he offers Invisalign® as a discreet and successful treatment option for crooked teeth. Your Invisalign® treatment will begin with a consultation with Dr. Bixby. Dr. Bixby will discuss your case with you to make sure you are a good candidate for Invisalign®. If you are considered an ideal candidate, the treatment can begin. Pictures, x-rays, and impressions will be made of your teeth. This will be necessary to formulate your exact treatment plan. Once a treatment plan is determined, custom-made clear aligners will be made specifically for your treatment. The Invisalign® aligners are made of smooth BPA-free plastic. 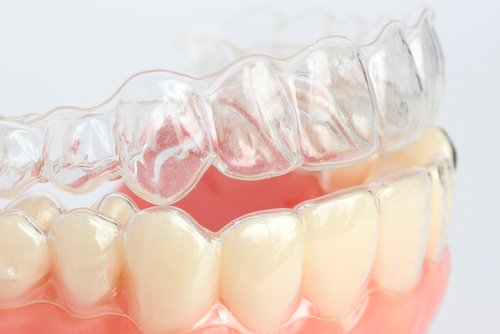 Generally, each patient will be given 18 to 30 slightly different aligners to be worn over the teeth. You should be sure to wear these aligners for 20 to 22 hours each day. The aligners may be removed for eating, brushing, and flossing. Each set of aligners is to be worn for approximately two weeks. After two weeks, you will move on to your next set of aligners and the next stage of treatment. You should expect to have dental check-ups approximately every six weeks to see how your treatment is coming along. Over time, these aligners will gradually straighten your teeth and align your bite. A typical patient can expect treatment to be complete in six months to two years. Invisalign® is becoming an increasingly popular treatment because of the benefits it has to offer over traditional metal braces. If Dr. Bixby finds that you are not an ideal candidate for Invisalign®, he can discuss alternative options with you. For our patients in Red Bank, porcelain veneers can be used to give the teeth a straighter appearance in as little as two dental visits. Whatever solution is right for you, Dr. Bixby will correct your bite and send you out of his office with a mouth that is healthier and more attractive. If you have crooked teeth and would like to improve your appearance as well as your oral health, schedule an appointment today. Dr. Bixby can answer any further questions you may have about the Invisalign® treatment process.